Dubai, UAE, August 09, 2018: du LaLiga High Performance Centre - the platform for top talent selected by LaLiga scouts through du Football Champions, announced that a selection of its top talents for the 2017-2018 season, arrived in Spain today for the coveted annual 21-day Scouting Camp, consisting of intensive training and competitive matches against some of LaLiga’s top youth teams including Sevilla FC and Malaga FC. Scouts from LaLiga will be present at training sessions and matches on the lookout for talents to invite for trials. The third annual du LaLiga HPC trip is witnessing the largest team of athletes to date with 48 players, ranging in age from 12 to 17 years and representing the top players selected from across the UAE through the duFC platform. The expansion of the platform this year to the U14 is providing younger players with the opportunity for the first time in the UAE to be discovered by scouts of LaLiga, the world’s strongest league, and trained by UEFA pro-certified highly experienced LaLiga coaches, providing them with a head start for a professional football career nationally or internationally. The scouting camp provides HPC talents a unique opportunity to be discovered during competitive matches at which scouts from LaLiga clubs will be present can select players to invite for trials which may lead to contract awards. The intensive programme has been designed by LaLiga’s UEFA pro-certified coaches to give these athletes the experience of training and competing at pro-levels, developing their mental and physical strengths. 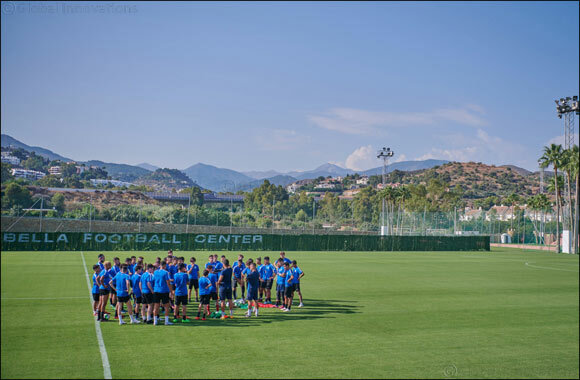 Training for the talents kicked off with an intensive program seeing the boys training twice a day and their first match against Cadiz scheduled on 11th August followed by matches against Sevilla, Almeria, Granada and a grand finale against Malaga CF, scheduled on 24th August. The du LaLiga High Performance Centre is a first of its kind outside of Spain, providing talented football players, scouted through the duFC platform with a rigorous year-round training program and competitive matches, including their participation in and leadership of the UAE FA Academy League, providing them with the opportunity of a lifetime as they embark on the journey that could mark the start of their professional football careers in Spain. du Football Champions is an award-winning international scouting platform in partnership with the world’s strongest league, LaLiga. It is a nationwide initiative featuring the UAE’s official Schools Cup and Streets Cup. Conducted in partnership with ADEC, KHDA the Ministry of Education, Dubai Sports Council and Abu Dhabi Sports Council. With the du LaLiga High Performance Centre, the platform aims to achieve sustainable human development through the discovery of promising talents, who will raise the bar on sports excellence at local and national teams as they become the next generation of professional male and female footballers.